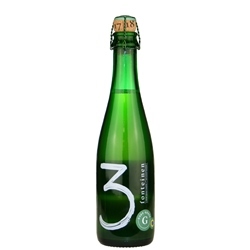 3 Fonteinen Oude Geuze is a true Geuze - a masterful blend of 1, 2, and 3 year-old lambic (spontaneously fermented by wild yeasts, and matured in oak casks), unfiltered and unpasteurized, and aged in the bottle for at least a year after blending. Brouwerij 3 Fonteinen's proprietor, Armand Debelder, employs the skill, knowledge, and supreme passion for real geuze that his father handed down to him. Refermentation in the bottle gives this Geuze its famous champagne-like spritziness. Golden-orange in color, its dry, fruity, intense, and complex aroma and flavor make it unforgettable. Bottling date: 28 mar 18. Best before: 26 oct 38. These bottles are the 42nd blend of the 2017-2018 season, blended with lambics from 6 different barrels and originating from 6 different brews. Properly stored, it will only get better and better for at least the next 10 years. Ratebeer.com rating: 100 (out of 100) 12.7 oz corked bottle. 3 Fonteinen is a lambic brewer and blender in Beersel, Belgium, founded in the 1880s and operated by the Debelder family since 1953. In Dutch, 3 Fonteinen means "three fountains" and originally referred to the hand pumps that were used to serve the three types of beer at the inn: lambic, faro, and kriek. In addition to lambics, 3 Fonteinen also produces several other non-lambic beers including a blonde, lager, porter, and witbier.